The NYPD has begun evicting the hundreds of Occupy Wall Street demonstrators that have been encamped in Zuccotti Park for almost two months….Hours before the massive operation commenced at around 1 a.m., Mayor Bloomberg, Police Commissioner Ray Kelly, Fire Commissioner Sal Cassano and other officials convened in secret at City Hall to greenlight the campaign to clear the park, sources said. 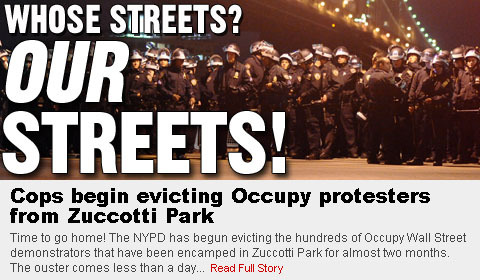 ….Cops handed out flyers early this morning declaring that, “The city has determined that the continued occupation of Zuccotti Park poses an increasing health and fire safety hazard,” to protesters as well as first responders, and ordered personal property removed. The real motivation for Bloomberg’s action appears to be OWS’s announced plan to “Shut Down Wall Street” and “Occupy the Subways” on Tuesday. Check your Twitter feed for the latest. MoJo’s @JoshHarkinson and @jameswest2010 are both tweeting live from Zuccotti Park.